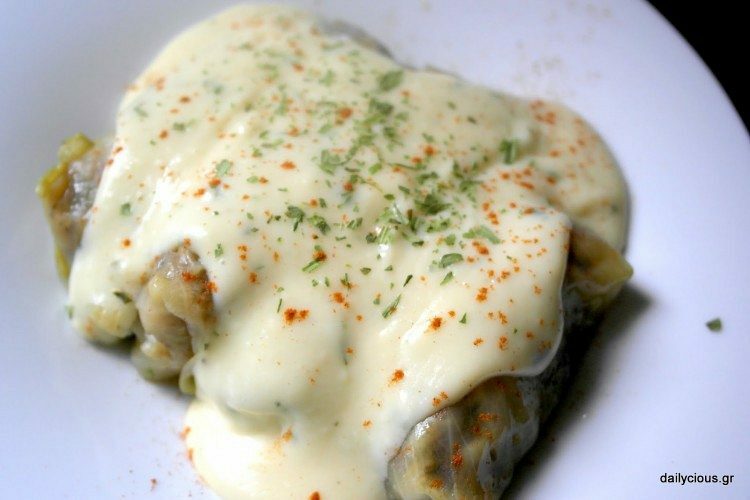 This traditional Greek dish, also known as “lahanodolmades” is made with white cabbage leaves stuffed with ground meat and rice and is covered in a light, lemony runny bechamel sauce. Lahanodolmades is a comforting winter main dish that is served warm. Core the cabbage head to remove the leaves more easily. Roll it over and place it bottom-side down in the pot with the boiling water and cook for 5’ – 10’ keeping the lid on. Drain the cabbage and open the leaves that can be easily removed. Place in the pot again and bring to boil before removing the rest of the leaves. The process is repeated 2-3 times until all leaves are removed except for the very small ones in the core. Combine ground meat, rice, onion, parsley, oil, salt and pepper in a bowl and mix well. Remove the tough ribs from each cabbage leaf, and place a teaspoon of stuffing on top of the leaf. Fold in the left and right edges of the leaf on the stuffing and roll like a cigar to seal. Place leftover cabbage leaves in the bottom of a wide pot and arrange the rolls in a layer tight against each other. Add the celery stalks, olive oil and pour 2 cups of hot water in the pot. Cover the rolls with cabbage leaves and place a dinner plate upside down on top of them for extra weight to help them retain their shape. Bring to boil, then reduce heat and simmer for 60’. Once the rolls are ready to serve, it’s time to prepare the sauce. Use a pan to melt the butter in low heat and add the flour while constantly mixing (using a hand whisk). Add the hot liquid from the pot containing the cabbage rolls and the warm milk while constantly stirring. Bring the sauce to boil, whisk the egg yolk in a bowl and pour part of the sauce to raise temperature. Add the mixture to the pot, remove from heat and add the lemon juice, salt, white pepper and ground nutmeg. Slowly pour the sauce over the cabbage rolls and they are ready to serve! If you wish, you may also add a spoonful of tarragon in the sauce and dust with red paprika (sweet or hot).